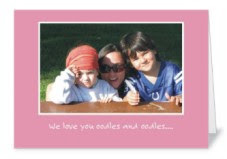 Here is a really hot deal — 3 FREE 5×7 folded greeting cards from Shutterfly! Simply enter code: 3FREECARDS at checkout. Plus, if you are new to Shutterfuly, you’ll get 50 free prints just for joining! These are high quality cards that you will be proud to send to someone this Valentine’s Day. The price makes it even more sweet! In addition they are offering 20% more off of many other items. Some things are down as much as 50% off already – so this makes for some great savings! To get this offer – use the code SWEETDEAL. You will have to do a spearate transaction from your card to get this offer. Both of these great deals expire February 2, 2010.